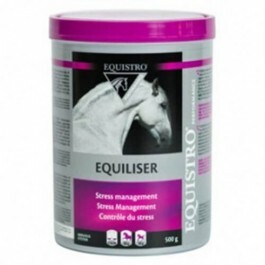 Equistro Equiliser is a dietetic feed supplement developed to help reduce stress reactions in horses. Ideal for use on horses showing signs of excitement. It is particularly recommended for use on horses exposed to stressful situations such as competition, transportation, new stables/field, clipping, farriery or external events. Once a year, Equistro Equaliser batch is analysed for environmental contaminant, ensuring that the product doesn’t contain ingredients likely to make a positive doping test. What are the benefits of using Equistro Equiliser? Ideal for horses showing signs of excitation and horses exposed to stressful situations. 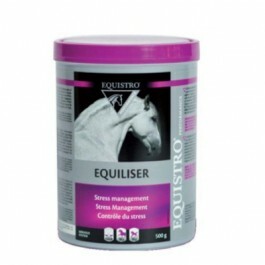 What is in Equistro Equiliser? How do I use Equistro Equiliser? Horses (500 kg): 20 g (1 scoop) per day. Ponies: 10 g (½ scoop) per day. Administer in the feed for the duration of 2 to 4 weeks. Start to administer at least 2 days prior to a change in circumstance. Is there any further advice I should know about Equistro Equiliser? It is recommended that a specialist’s opinion be sought before use or before extending the period of use.